Unfortunately, Helen didn't get in touch so I had to choose another winner. Eva, I will be in touch. Thank you so much to Victoria for the giveaway. 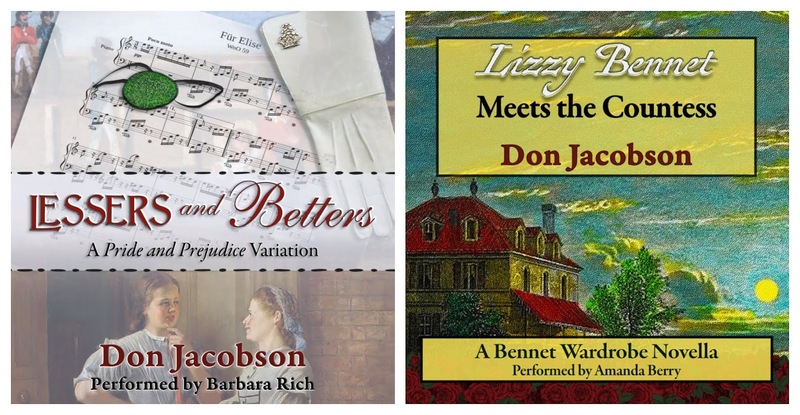 Remember, if you weren't lucky this time you can treat yourself to the audio of The Secrets of Darcy and Elizabeth now! You can buy this book in print, e-book or audio to enjoy today - Amazon UK /Amazon US, Audible UK / Audible US. 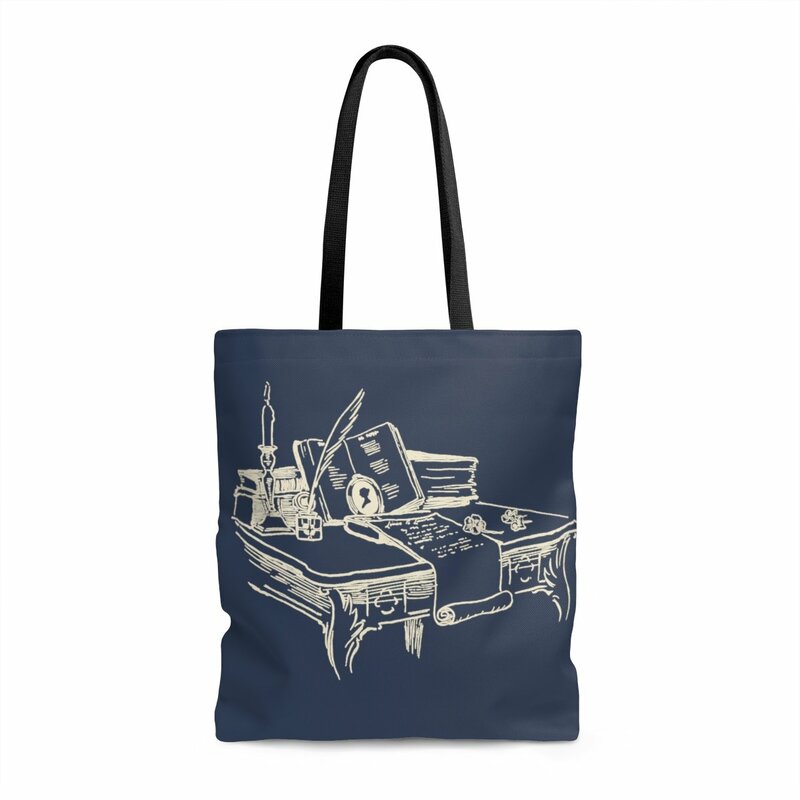 These days there are so many lovely book-related items for we bookworms to buy and I am featuring one today. 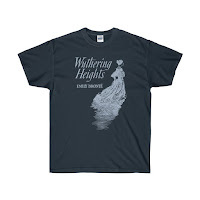 Literary Book Gifts has items such as t-shirts and totes relating to various authors, including Jane Austen, Charles Dickens and the Brontes, and the owner has offered a discount code for visitors to my blog. 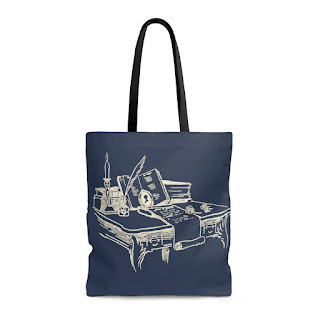 You could carry round your love of Jane Austen for all to see with this gorgeous tote bag. 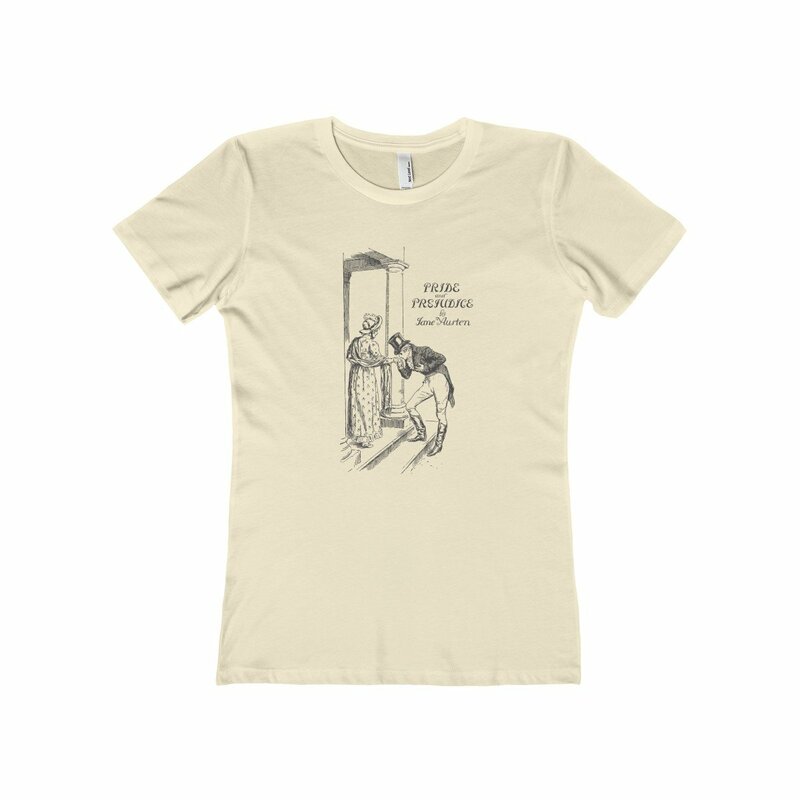 You could keep Pride & Prejudice close to your heart with a PnP tee. Need suitable attire to run around on the moors seeking Cathy? There's a t-shirt for that too. The full range of items can be found here: https://literarybookgifts.com. This can be used to give you 20% off anything in the store with no minimum purchase, and can be used unlimited times. I hope you enjoy your items, if you choose to take advantage of the discount. Thank you so much to Melissa from Literary Book Gifts for offering us the code! 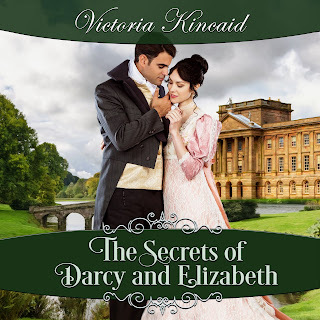 Today I'm welcoming the lovely Victoria Kincaid who is treating us again, this time with a guest post and a giveaway of an audio copy of The Secrets of Darcy and Elizabeth. 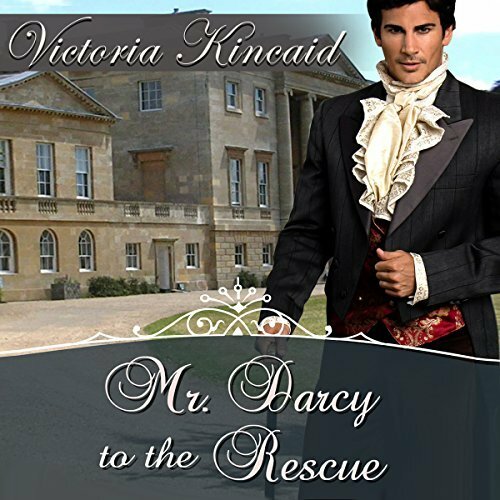 This is one of Victoria's earlier novels which has now been made available in audio. I'll start by sharing the blurb with you, and then hand over to Victoria for a guest post. In 1803 a treaty has allowed England and France to enjoy a brief peace in the midst of the Napoleonic wars. With Darcy despondent over Elizabeth’s refusal of his proposal, Colonel Fitzwilliam proposes a trip to France as a distraction. In Paris Darcy unexpectedly encounters Elizabeth, who is visiting with the Gardiners. This is his opportunity to court Elizabeth properly. But before he can make much progress, England declares war again and Darcy must help Elizabeth flee France. 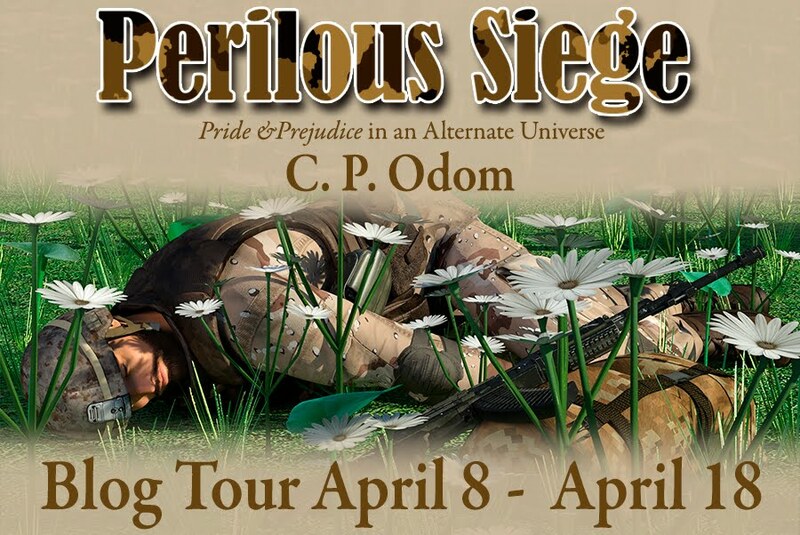 En route, Elizabeth and Darcy must battle brigands, French soldiers, illness, and their own mutual attraction – all without a chaperone. When they return to England, they have their own secrets to conceal – even from those closest to them. Hi Ceri, Thank you for having me back so soon! I am thrilled that The Secrets of Darcy and Elizabeth is finally out on audiobook. Narrator Stevie Zimmerman did a terrific job (I particularly like her voice for Darcy). Readers are in for a real treat! You can buy this book in print, e-book or audio to enjoy today - Amazon UK / Amazon US, Audible UK / Audible US. Or, you can enter the giveaway to win an audio copy. Victoria is offering an international giveaway of The Secrets of Darcy and Elizabeth. To enter, just comment on this blog post by the end of the day on 29 August 2018. Please leave a way for me to contact you, should you be the lucky winner. 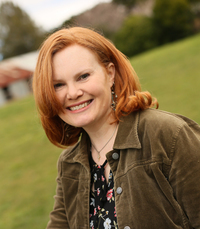 Today I'm welcoming a new JAFF author, Elaine Jeremiah, for a guest post about what drew her to writing in this genre, and an excerpt of her book, Love Without Time. I’ve been writing pretty much for as long as I can remember. Growing up, I wrote and told loads of stories. I wrote short stories at school, which people seemed to like – I won a competition – and told tall tales of warring cats and dogs to my younger siblings on long car journeys. As I got older, I experimented with various genres. The first novel I ever wrote was called Fresher Girl, about a girl going away to university for the first time. It wasn’t great, but I kept persevering. Five years ago, I self-published my first novel. But it wasn’t a Jane Austen fan fiction novel. It was more of a family saga, called The Inheritance, about two sisters – one who is sensible and works hard and the other who demands her inheritance from her father early, then loses it all in the space of a year. It didn’t exactly set the world alight! I kept writing though and wrote two contemporary romances. Nothing that I’d written really felt right for me though, until my husband suggested I try writing Jane Austen fan fiction. I’ve been a huge Jane Austen fan all my life. I was lucky enough to grow up in the same county – Hampshire – that she did. I’ve walked past the house in Winchester where she died many times and I ended up going to university in Winchester too. I have visited her cottage at Chawton a number of times, as well as Chawton House, where her brother lived. So I feel a real affinity with Jane Austen and when I started writing my first Jane Austen fan fiction novel, Love Without Time, I felt like I’d finally found my niche. Love Without Time isn’t your typical Jane Austen fan fiction novel, as it’s not based around any of her novels. But it is about a girl who’s a huge fan of Jane Austen, who time travels back to Regency England, and all of the things that happen and problems she encounters there. I thought it would be a fun idea to imagine what would happen if someone from the twenty-first century time travelled back to Regency England. What would it be like? What would they see/smell/touch? How would they react to their experiences? I enjoyed writing the story so much, I decided to turn it into a trilogy and right now I’m hard at work on By Time Divided, the second book in the trilogy. I hope you enjoy Love Without Time if you get to read it. Big thank you to Ceri for featuring me on her blog. Just then I felt a wave of fatigue wash over me. And I had never been so thirsty in my life. I felt myself begin to sway, but a small hand which was surprisingly strong caught hold of me and set me upright. I looked to see who my rescuer was. It was the other young woman I’d seen, who’d been standing next to the woman who had questioned me. Her dark eyes regarded me with sympathy and I was comforted. ‘Thank you,’ I said gratefully as she led me to a wooden chair at the side of the marquee. I sank down onto it; it felt like bliss to finally be seated and I also felt as though I really had been in an accident whilst on a long journey. I could sense everyone’s eyes on me again, but I ignored them as I closed my eyes. As I did so, my thoughts returned to my own time. There was a sharp pain in my chest as I remembered Ted, as if someone had struck me. How could I have forgotten him, even for a moment? All my feelings of guilt for what had happened were renewed in my mind. I opened my eyes. I didn’t have much time to ponder this, as the young woman had returned with what looked like a glass of wine. She stood in front of me with Isabella and the petite woman, who were watching me with concerned expressions. It was then that I noticed an older woman standing behind them, eyeing me as a hawk would a mouse. ‘Here you are,’ the petite young woman said with an anxious look, handing me the glass. I frowned for a moment – why were they not just giving me water – and then I remembered from my history books that very few people in Georgian times would drink water. It wasn’t safe. I caught her eye; her expression had changed and she was giving me an odd look as if she’d seen my puzzled expression. But she didn’t comment on it. I took a sip of the wine and was glad I had, as I felt its warm tang soothing me from the inside out. Charles gave me a curt nod; he was the dark-featured gentleman I’d already spoken with. William looked friendlier, giving me a curious glance, which rather than making me feel scrutinised made me want to get to know him. 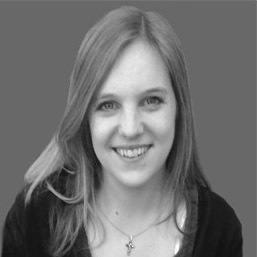 Elaine Jeremiah lives in England with her husband and their golden retriever. When she was young she wanted to be a famous actress and win an Oscar. Sadly for her that never happened. Instead writing took over. She has written stories from a young age, winning writing competitions at school and praise from her teachers. Growing up she continued to write, inspired by events in her life and even dreams she'd had. In recent years, especially since graduating from university with a degree in English, she has had more time to devote to writing. She has now written and self-published four novels. 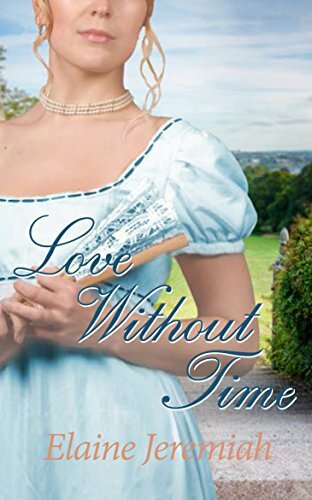 Her latest, 'Love Without Time', is her first Jane Austen-inspired story, a time travel romance, and the first in a trilogy. Today I'm featuring a new to me author, Carolyn Miller. She has written a Persuasion-inspired book, Winning Miss Winthrop. Let's have a read of the blurb and see if we can see the Persuasion influence, and then I'll hand over to Carolyn for a guest post about how she came to write historical novels, and in particular, novels inspired by Austen's work. Carolyn has also brought us an excerpt of the book. Catherine Winthrop is almost at her last prayers, rejected years ago by the man who stole her heart. When tragedy brings him back into her life, she must suffer further grief in silence, amid her family's pain and hostility, which eventually sends her to seek solace in Bath. Jonathan Carlew might be wealthy, but the mystery surrounding his birth has shadowed his life, bringing fresh challenges as he takes on the Barony. Caught between appeasing the Winthrop family's concerns and doing what he could to salvage their failing estate, he must also weigh the echoes of the past with the demands of his new responsibilities. Two hearts must decide whether present speculation will condemn them to the dust of their memories, or if the whispers of forgiveness can provide freedom for the future. I’ve always hankered for an era not my own. Growing up, some of my favorite authors included such notables as Laura Ingalls Wilder, Louisa May Alcott, Mary Grant Bruce (an Australian author who wrote the Billabong series, about turn of the century Australian graziers—hello, I am Australian J), and of course, my favorite (perhaps because I could relate with the hair color of her red-headed heroine): L. M. Montgomery. 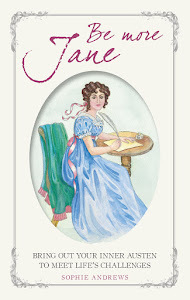 The writing of these ladies varied, from flowery flights of imagination to pragmatic epistles of life on the land, but their skill in drawing the reader into their worlds made for many a pleasurable hour, envisaging Jo, Anne and many other spunky, imaginative girls from an era so different from 1980s Australian suburbia. As someone who perhaps longed to live in these times a little too much I suppose it was inevitable that I would one day write a story based in the Regency era. My writing journey started with contemporary stories, after I watched the closing ceremony of the Vancouver Winter Olympics and wondered why an Australian girl was walking into the arena holding hands with a US athlete. What was their story? Despite my best efforts, I couldn’t find out, so I made it up J Thus began a very long journey to publication as I honed my craft through entering online writing contests and taking on feedback, among which came the realization that US publishers aren’t so interested in stories with Australian characters or settings, so perhaps I should write something they were interested in: historical romance. 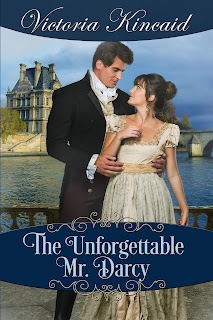 So I kept writing, a Regency romance this time, something I hoped could blend the wonderful wit and memorable characters I love in Georgette Heyer’s Regency-era novels, with the social mores and subtlety of Jane Austen, along with my own Australian sensibility, and desire to write stories offering hope. I kept entering contests and started finaling and eventually gained the attention of a US agent, who agreed to represent this little Aussie (yay! ), and eventually found me a US publishing home (double yay!). 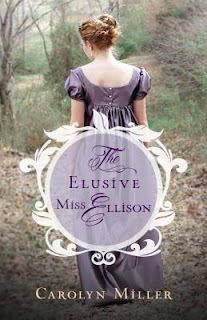 The Elusive Miss Ellison, an inspirational Regency romance with shades of Pride and Prejudice, became the first of my Regency Brides: A Legacy of Grace series, published by Kregel Publications. Last year was a wild ride with my author debut, then seeing two more books release, all while juggling writing, editing and learning more about the joys of marketing. 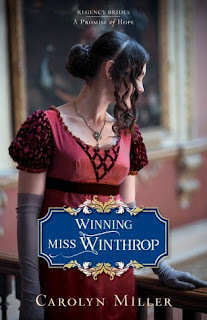 A second series (Regency Brides: A Promise of Hope) is being published in 2018, with the first of these, Winning Miss Winthrop, releasing in March this year. Winning Miss Winthrop is something of a homage to Persuasion, which vies with Pride and Prejudice as my favorite Jane Austen. I love the angst of poor Anne Elliot, the way the social niceties of the day force her to hide her pain as she suffers from the thoughtlessness of those around her, the way she patiently holds true to her values even as all hope (and love) seems lost. And how can you not love someone like Captain Wentworth, unable to ever find Anne’s equal – especially when he looks like Rupert Penry Jones? In 2015 I was extremely blessed to visit my sister in England, managing to see several places I’ve only ever dreamed about—or ‘seen’ in books, films or TV- and of course, my first port of call had to be Bath. A visit to this World Heritage-listed town, filled with grand Georgian buildings and cobblestoned streets, helps understand the need for sedan chairs instead of carriages (many streets are steep), whilst ‘taking the waters’ at the Pump Room and seeing the Assembly rooms gives new insight into Austen’s references to such activities in her novels—and also adding greater authenticity to my own work, as does a visit to the Jane Austen Centre (and enjoying high tea there ‘with Mr. Darcy’ J). I have a page on my website about my time there: www.carolynmillerauthor.com/a-trip-to-bath which is a fun way to connect a little more with some of the scenes mentioned in Winning Miss Winthrop. “Well, nobody shall ever accuse you of being a fool, you stingy old man,” Viscount Henry Carmichael said, tease in his eyes. “Must it be one or the other?” Jon asked. “One simply has to decide which of the two?” Jon suggested. “Exactly.” The heir to the Earl of Bevington nodded. The viscount handed over twenty-five pounds, muttering about the audacity of such ladies to walk without consideration for the eyes of men. That evening in question had been one of the more excruciating of his life. Perhaps if he’d learned to flirt like Carmichael or Hale he might be more successful in ensuring the women who flocked to him knew not to expect anything more than a deftly turned compliment. But as Hale had commented that evening, Jon’s more serious demeanor and deep voice lent a gravity to his words that only seemed to encourage the clinging young ladies with whom he had no desire to further his acquaintance. His companions both stared at him before Hale gave another loud harrumph. Jon chuckled, shook his head at his friends’ antics, and retired once more behind the screen of The Times. His smile faded, the printed words before him meaningless. While he didn’t begrudge them—they were his friends, who had helped keep him sane these past years when India had a way of hardening even the kindest of men—he couldn’t help but wonder how these gentlemen would rate the woman who had once caught his eye. Not strictly pretty, let alone divine, he couldn’t help but think she would rate rather poorly on Hale’s scale of attractiveness. His fingers clenched. Relaxed. Not that he should care. These were foolish thoughts. He was unlikely to see her, and even if he did, she had long ago made her feelings abundantly clear. No. Perhaps he was a fool after all. Surely two years of adventure and business should have been enough to rid him of these feelings. Perhaps it was time to think on a lady who might not mind his connections to trade, at least until that far away day when he might assume the title. His earnings from his time on the Indian subcontinent should, correctly invested, hold out for quite a few more years, and the interest on his shares in his father’s companies was steadily improving, so Trelling said. Perhaps there was a lady who might not mind being married to such a man. He could offer constancy, and quite a tidy fortune, if little else. Perhaps one day there might even be one prepared to overlook the haze concerning the legitimacy of his birth. 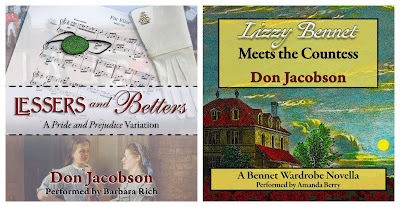 Recently Don Jacobson joined us for a guest post about audio books. He's recently made a few of his titles available in this format. Don was kindly offering to giveaway 2 sets of giveaway codes for US/UK listeners. Congratulations to you both. I have contact details for Betty, but I'm not sure about KateB so I'd really appreciate it if you could contact me within the next few days. Thank you so much to Don for the giveaway, and best of luck with the audio titles! 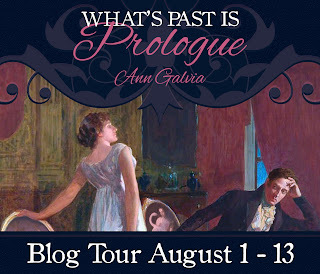 Today the blog tour for Ann Galvia's newest Pride & Prejudice variation/sequel, What's Past is Prologue stops by here for my review. There is also a generous giveaway that you can take part in! I'll start by sharing the blurb with you and them move on to what I thought of the book.